Last Friday I walked into my apartment after seeing Larry Crowne and lo and behold, my boyfriend was nonchalantly sitting in my living room, chatting with my parents. Not for a moment this summer did I expect to find him at my house, especially when he lives 1,300 miles away in Minnesota. As it turns out, he has been secretly planning behind my back with both my family and my friends to stay here for two weeks, from July 1st to the 15th. So now, when I’m not blogging for the Campus Clipper, I’ve had the pleasure of showing off my hometown to a guy who’s never visited the big apple. So far I’ve taken him to his first New York Broadway musical, the South Street Seaport, fancy restaurants, the July 4th fireworks, and the like. But by the time he leaves, I really hope that he’ll have gotten to see more than just the average tourist traps. 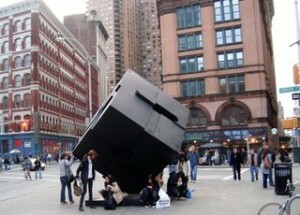 Of course, going to the MoMA and the Empire State Building are a must, but I also want to take him to all my favorite stores, restaurants, and parks where my friends and I would visit on a regular day, such as the Strand bookstore, Washington Square Park, and Eileen’s Cheesecake, and Insomnia Cookies. Although the tourist attractions are what everyone thinks traveling to New York is about, I’ve found over the past few days that it’s much harder to keep someone entertained than I thought. And I don’t blame them. Finding the Statue of Liberty overly exciting is difficult when I’ve lived in New York City for 19 years, but as it turns out, the Statue of Liberty isn’t that enthralling to most of the jaded teenagers of America. So sometimes a night in just hanging out with friends is really all a tourist might be looking for—a chance to experience the ‘real’ New York teenager’s life. So when I’m all done showing him the glitz of Times Square, chilling at home playing Risk is still fun. Some of my other places around the city that I want to take him to are Chinatown and the Piers along the East and West sides of Manhattan (if only I wasn’t on crutches so that we could ride bicycles around the city!). 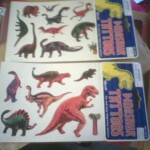 Since we’re both students, we’ve been having a blast rocking the student discounts Campus Clipper offers us, such as the discounts at the Village Party Store, where we’ve purchased sheets of temporary dinosaur tattoos and have decorated ourselves to the point of hilarity. The red brick interior and dark brown tables and chairs bring a very pizza parlor vibe to this Turkish restaurant. In much the same way pizza parlors offer more popular variations of Italian food, Kebab Garden serves up popular Turkish fare such as the titular kebabs as well as hummus, babaghanouj, and gyro sandwiches. Also available is non-Turkish fare such as macaroni and cheese and spaghetti with tomato sauce as part of the “Daily Specials” on select days. Despite not being on the daily special menu, the food my friend and I ordered was still inexpensive and delicious. Think you’ve tasted all gyro and kebab have to offer? Think again; Kebab Garden is a lesson in why regional food differences really do count. I ordered the lamb doner kebab, which comes with rice and salad, while my friend ordered the chicken shish sandwich. And despite the store being open to the hot temperature outside, the restaurant itself remained only pleasantly warm. We also did not have very long to wait for our food. The chicken shish sandwich was ready in under 10 minutes, but be advised if you order the kebab it will take a little more time. But it’s worth it, especially if you’re picky about your lamb like I am. I wanted it well done, but not charred or overdone in anyway. Crispy but soft and with just the right combinations of spices is how I like it. Kebab Garden’s lamb doner kebab delivers and then some. The meat is tender and juicy, really taking advantage of the earthy taste and somewhat tough texture of the lamb. It came cut in thin strips, and when doused with the white sauce that came with my order, was absolutely perfect. It paired really well with the rice and salad giving the meal a very down-home vibe, too. The chicken shish sandwich was just as good as the lamb doner kebab. The chicken was tender, flavorful, juicy–everything you could want from chicken–with an added bonus: it was Turkish style! Think you’ve had chicken in a pita before? Think again, as Kebab Garden’s chicken shish sandwich will blow you away to the point you’ll keep eating long after your full. Between the sandwich and kebab, my friend and I completely forget the soft, warm bread were given to start our meal. The yougurt drink was also forgotten, a cold creamy yet salty drink worth trying. To finish her meal, my friend ordered the baklava which initially didn’t interest me. I’d had baklava many times before, but the flavors of the pastry always seemed off to me and I never really liked it. However, continuing the trend that afternoon, Turkish baklava is also very different from the usual Grecian variety. My friend’s portion was heated up so she could sample the natural flavors better. Hmm, I thought looking at the flak dessert, this looks worth trying, so I dug in and was happily surprised. It was delicious, flakier and with a more mellow sweetness than I was used to in baklava. It’s definitely a must-order when visiting Kebab Garden. If you’re looking for Turkish home-cooking or even a new spin on your beloved kebab or gyro, I highly recommend visiting this establishment. They’re currently redesigning their restaurant and have changed the service from self-serve to waitstaff service. 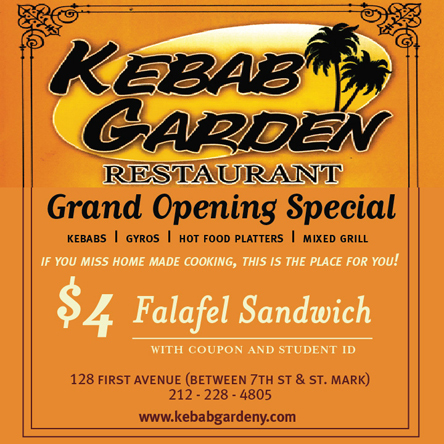 Kebab Garden is located on 128 First Avenue between 7th Street and Saint Mark’s. They’re open 11:00AM to 3:00AM everyday, and make for great post-bar and club food. In fact, it’s great any time at all, especially with a student discount like the one offered below. Interested in more deals for students? Sign up for our bi-weekly newsletter to get the latest in student promotions. For savings on-the-go, download our printable coupon e-book! Over the last few years, one of the biggest trends in New York City eating has been the proliferation of restaurants that specialize in providing you with very tasty hamburgers. From Shake Shack (the way uptown one on 86th St.) to Goodburger (the way downtown one by Wall St.) to countless smaller places, burgers have come to mean far more than just a Big Mac or a soggy diner burger. The proprietors of this new generation of burger places don’t just want to feed you, or even just to feed you well––they want to show you that a hamburger can be a delicacy, even if it only costs seven (or ten or twelve) dollars and takes five minutes to prepare. 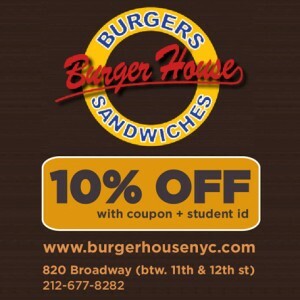 To the many devotees of these tasty burgers, I’d like to introduce a new contender: Burger House, on Broadway between 11th St. and 12th St.
Burger House opened its doors earlier this summer, and has been gaining in popularity among locals and the summertime students of nearby NYU and the New School ever since. It offers a unique take on the gourmet-yet-inexpensive burger craze, billing itself as a “zen grill.” But don’t worry: there are no gimmicks or overdone ambiance, just a wide selection of burgers and sandwiches and some crispy french fries. When it comes to decoration, Burger House keeps it simple, but the food shows no lack of imagination. As you can quickly tell from one of their sidewalk demonstrations, the chefs at Burger House take their work very, very seriously, and their creations are more than just another tasty burger or sandwich. There is a breadth to the menu at Burger House that is almost startling, with a half dozen kinds of meat (or veggie) available on a burger. While many burger places might offer ten different burgers in the menu, usually the only thing separating the choices is toppings. But at Burger House, you can get bulgogi beef or shrimp meat on your bun, making their menu many times more complex and intriguing than that of the typical burger joint. There are also eleven sandwiches on offer, with just as many choices of filling as the burgers. But it’s not just the abundance of choice that makes Burger House special; the care and attention to detail paid on each dish is exceptional, and the burgers are also exceptionally tasty. The Kalbi Cheese Burger is especially delicious––its rib meat is sweet and savory and will melt in your mouth. The bulgogi beef is juicy and nicely textured, and not to be found at just any burger joint. And of course, for a burger place to be any good, the fries have got to be enjoyable, and I’m happy to report that those at Burger House make the grade: they’re freshly crispy, with a little crunch on the outside, and have some seasoning that gives them a nice flavor without overpowering the extra flavorful burgers. Out of dozens of downtown burger places, there may be a new favorite to be found on Broadway behind an unassuming storefront and a simple name. Time will tell whether Burger House can build a big, dedicated fan base and prove itself to be the equal of the other popular burger joints in the area, but whether it becomes a landmark like Shake Shack or not, it has already contributed to the burger culture with a unique menu and some high quality food. 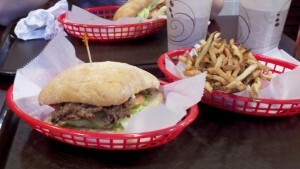 If you’re interested in a burger unlike any you’ve ever had, I suggest you check it out. Click to get a coupon for free coffee and other great Student Discounts! The beginning of a great legacy. I can still remember my first experience with Harry Potter. The year was 2001 and I was seeing a movie whose title and content I have no memory of with my younger sisters and Dad at a local movie theater. But what I do remember seeing was the trailer for the upcoming release of the first Harry Potter film: Harry Potter and the Sorcerer’s Stone. The glow of November on the screen till this very day is still present in my mind. 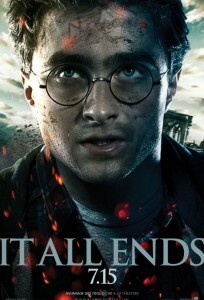 I was captivated and that following November I saw the film and so began my love for both Harry Potter books and films. I often find that I associate Harry Potter with my childhood, and I certainly believe it is representative of my generation. People my age all over the world essentially grew up with Harry Potter and this is why the release of the second and last installment of the final film this past week is considered widely a bittersweet moment. Without a doubt, I felt it was absolutely necessary to view a midnight showing of Harry Potter and The Deathly Hallows Part 2 this past Thursday for its U.S. premiere at the same theater I saw the first. I brought along my younger sister who was equally excited and completely aware of the likely possibility I would embarrass her by tearing up, which I did. My local theater was overrun by avid Harry Potter fans some dressed in Gryffindor uniforms and many foreheads were marked by a lightning bolt scar. Luckily my sister and I were spotted by a group of High School friends and acquaintances that allowed us to join them on line and then began the nostalgia. The overall consensus amongst the group was the feeling that their childhood was coming to an end. In simple words: the idea of not being a kid anymore makes me sad. However, I’m happy that my transition to imminent adulthood has become jarringly clear because of a franchise that I’ll always love. I had no qualms whatsoever with the film. It truly is an achingly beautiful adaptation of the final moments configured by JK Rowling. Also, the epilogue perfectly captured the bittersweet feeling shared by fans worldwide. It was just a perfect balance of melancholy and sheer optimism. Proof of this is the combined mix of smiles and tears I experienced when watching the films end. And for the sake of my own street cred, let it be known the theater was chock full of young adults, both male and female, tearing up because of the films content and its projection, but also because of it’s beautiful parallel to the life of a growing individual. It really is the end of an era, a great one at that. But at the same time, the Harry Potter franchise is certainly forever because its legacy is so great. I’m sure many fans my age anticipate a future where they could share the magical world of Harry Potter with their own children. Similar to the way many of us have shared the bewitching experience with our parents. My mom mentioned looking forward to owning all of the films on DVD because it’d be both incredibly nostalgic and fun to watch all of them in a row. I personally cannot wait for such a time too! Luckily this can be the case too for students who are conscious of student discounts. 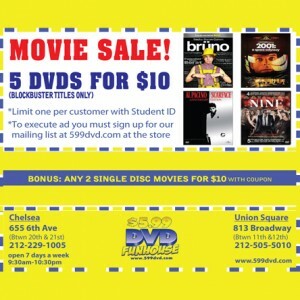 I suggest checking out DVD Funhouse, they have a discount were you can purchase five DVDs for only ten dollars! This means you can invest in buying five of the films for a Harry Potter movie night. Harry Potter will always serve as a reminder of the curious kid that still exists within me. In many ways the Harry potter experience has preserved my nine-year-old self in both memory and continued spirit. I know I’ll always be in awe of the magical world I watched on screen and read about. I’m sure until the very end. For years, Wild Ginger in Soho was one of my favorite places to go for a vegetarian dinner even before I was vegan. Inside, the dining room is incredibly small, but unlike most other Manhattan restaurants, the management doesn’t pack the place with as many tables as possible and make all the customers bump elbows with the blind dates next to them. If there’s anything that I dislike the most when I’m eating out, it’s having to listen to people being so awkward with each other that it makes me feel nervous for them. In contrast, Wild Ginger’s tastefully arranged tables with plenty of space between them in addition to a dark and earthy décor make the place feel cozy instead of bustlingly busy. Personally, I think their appetizers are the best items on the menu, and they host a great variety of dumplings, including shumai and samosas. 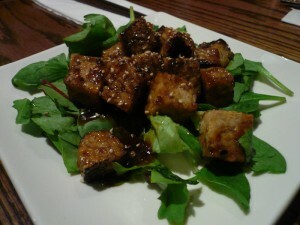 I’m also a big fan of tempeh, and Wild Ginger cooks their Satay Tempeh well and doesn’t over-sauce it. As for a main course, one can enjoy their hot or cold Asian noodles, in soup or dry, without having to worry about weird ingredients like fish sauce or meat extracts that traditional Asian restaurants may use. They also have soy protein prepared in many different styles, so whether you like it sweet and sour or black peppered, there are plenty of options for a filling mock-meat meal. When I go, I like to customize my dinner by getting a couple appetizers and one of their salads, which are generously portioned and beautifully served with unique mixtures of ingredients. Try the Watercress Salad with avocado, beets, alfalfa sprouts, and a sesame sauce for healthy filler before you decide on which amazing dessert to order. My favorite is the Vegan Cheesecake despite how small of a portion I get because it has such a great texture without being too heavy. If I’m splitting with someone, the Peanut Butter Bomb is rich, chocolate-peanut buttery, and huge. You can even ask for a scoop of vegan ice cream on the side. The waiters are always super nice and never keep me waiting for very long no matter how packed it is. Even if I’m just getting takeout, they won’t hesitate to bring me a cup of tea when I ask (and sometimes even if I don’t). Though the prices might be a bit steep for an everyday lunch, they offer a 15% off coupon with student ID through the Campus Clipper. 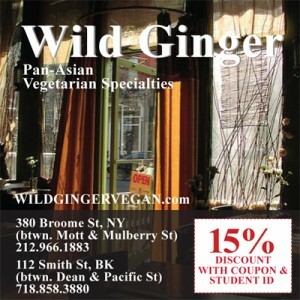 Wild Ginger in Soho is conveniently located a couple blocks away from NYU’s Broome Street dorm and is a short walk from Lafayette. Take advantage of the student savings with the coupon below, and enjoy a great vegan/vegetarian meal for less at Wild Ginger! I have been inside my university’s chapel three times: once for opening exercises freshman year, once for a chapel choir concert (and I had a massive crush on someone in chapel choir), and once for a senior thesis performance of a passion play that my friend was stage managing. It’s a beautiful building, all gray sandstone on the outside and dark wood pews inside. Alumni get married there every weekend in the spring. I pass by it almost every day on my way from the library to the late night café that serves free cookies (which is right under the Office of Religious Life). I was not raised in a religious household, and I’m still very nonreligious in college. But religion happens to be a large part in the lives of some of my friends, and contrary to conventional thought, college is not quite a Bastion of Sin and Depravity. I’m not lying and saying that college is a tame, sleepy educational institution. But faith does have a place in a college campus. The physically imposing presence of a university chapel aside, there are plenty of places on a campus to find people of your own faith—often through student-run groups. On my campus, there are several Christian groups of varying involvement and denominations, for those whose other extracurriculars might take precedent (or might not). Mission trips over breaks are planned for several, while others just involve a weekly Saturday night dinner. We have a Center for Jewish Life that serves kosher food every day—it’s available to the entire student body, as well, and the building itself offers great study rooms (and it has a printer, too, so I can print out my labs on my way to class after lunch). The CJL also holds a range of services for various movements (Orthodox, Conservative, and Reform are the main three denominations), and it often presents its own cultural events to accommodate certain restrictions. For example, there is a yearly CJL-produced play (the play does not have to be about anything Jewish) that does not perform on Shabbat, unlike most of the other theatrical productions on campus. Furthermore, the university administration isn’t the only source of religious needs for students. There are many student groups on campus who offer support and resources in varying capacities, again depending on your personal commitment. On my campus, there are several Hindu and Muslim groups, some which provide services and some which simply provide a social group for its students on religious customs (such as navigating the dining hall offerings or leaving bags of treats outside its members’ dorm rooms on holidays). My high school history teacher once described colleges as the Bastion of Liberalism and Secular Thought. And while there is certainly a lot of freedom and hedonism, if you’re looking for people who share your faith, to whatever degree—you’ll find them. There’s often a large activities fair at the beginning of the school year where you can add your name to a group’s mailing list, but if you don’t sign up in September, it’s not a big deal—groups will publicize their activities throughout the year, and it only takes a minute to show up and talk to the people already involved about involving yourself. Naturally, most of these groups will throw study breaks and other large free food events (free food in college is always dependable). When you become involved in them, it’s probably good to scope out a food venue that gives student discounts or bulk discounts. 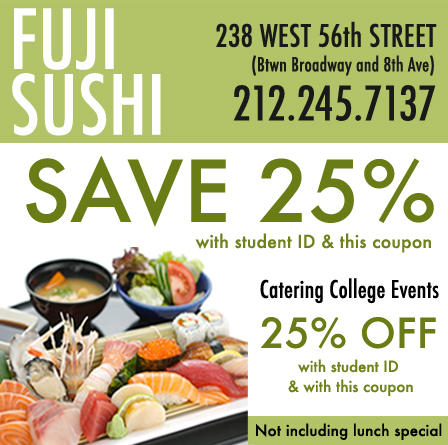 Fuji Sushi, for example, has this great deal for 20% off catering college events. And college students, of whatever faith, love sushi. I tweet while I’m at work. I’ve yet to master the hashtag. My blog of hedonism and liberalism and other college mainstays. 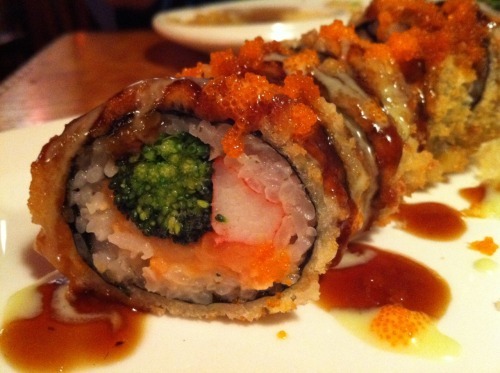 In the bustling crowd of downtown cuisine, one of the best and most ubiquitous options is sushi. Although all of New York’s Japanese places could never match the dizzying number of Chinese restaurants, there are sushi spots all over the city, and in certain areas, like around St. Mark’s, they are almost as densely packed as Chinese places are everywhere, which is ideal for the young and cash-strapped, in search of student savings, since competition (as any econ major could tell you) drives prices down. It also offers you, the customer, a choice of about a dozen different sushi joints on the three blocks of St. Mark’s Place. Everyone loves sushi: it’s prepared quickly, fun to order, fun to eat, and can be affordable on almost any budget. Restauranteurs can dream up all kinds of mind-blowing decoration and ambiance, but there’s really nothing like walking into a sushi place (any sushi place) and seeing a grim-faced chef roll up and chop up sushi rolls at lightning, finger-endangering speed. It’s the Japanese food equivalent of watching a fat Italian man spin pizza dough in the air, but it’s way better, since there’s very sharp knives involved. How could anyone manage not to enjoy such appealing food? I know that some people have a problem with the whole raw-fish-and-seaweed side of sushi, but I’d say that anyone over age twelve that can’t get past a little seaweed is making a grave mistake by missing out. 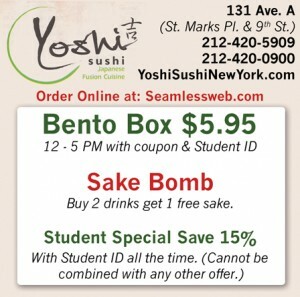 —Yoshi Sushi is located at the east end of St. Mark’s, right across from Tompkins Sq. Park, and is a great option for their student discounts. It’s a smallish place, but they have great deals (like a big bento box for $5.95) and a great location, and they deliver! But most importantly, the sushi is high-quality. I’m not an expert, but I know that their BBQ beef mango roll is both original and delicious. —Kenka, right on the busiest block of St. Mark’s, between Second and Third Ave, offers a ton of menu choices in addition to sushi, including some more unusual options, like tongue, liver, and other animal parts that are generally not found on sushi menus. They have so many dishes that the menu is huge and heavy in your hands, and can provide more than a little light reading. The place’s popularity might actually make it a little less enticing: there’s usually a wait, it’s very loud inside, and it’s not that cheap, as far as sushi spots go. But the food is great, and pitchers of Japanese beer are only eight dollars. If you can handle the wait and the noise, Kenka’s definitely worth it—and you get free cotton candy after your meal! — May’s Ku E Ban is on Second Ave, right next to Pommes Frites, and could be indispensable to a sushi-loving student. When you really need a roll or two, but you really can’t afford to spend much on it, May’s is there for you: they have an amazing deal, available all the time, that offers half price on sushi as long as you spend over eight dollars. I don’t think I need to emphasize how awesome this deal is. There aren’t many places at all where you can get a ton of good sushi for the price of all of the change lying around your room. May’s doesn’t have the cool atmosphere of Kenka, or the innovative dishes of Yoshi, but it does have an ample supply of cheap sushi. So the next time you’re trying to decide from the billions of food choices downtown, and feel like a little sushi, take a stroll down St. Mark’s, and find one of these places between the bars, thrift stores, and head shops that fill out the street. Or try one of the sushi places that I’ve never tried before. Whatever kind of sushi spot you prefer, there’s probably one to be found. Comment, and tell us about the other sushi places in the area! Check out Alabaster Bookshop for cheap books and browsing fun. I’ve always been a bookworm. As a kid, I’d stay up way past by bedtime devouring a book page by page. My favorite part of the school day in my Elementary years was story time and any independent reading assignments were seen as a sort of academic blessing. Because I’m an avid reader it’s not much of a surprise that I truly enjoy browsing and buying books from bookstores, or even just raiding the shelves of my local library. I feel that choosing a book for yourself is very much a part of the fun and experience of reading, also I find books are one of the nicest gifts to give or receive. Another thing, I really love the feel of the pages against my fingers when flipping a page and even the smell of pages, yet in today’s world more and more I notice that Amazon’s Kindle and Barnes & Noble’s Nook are replacing the tangible beauty of the book. Friends and family question me as to why I don’t invest in an electronic reader when I love to read as much as I do and here’s why: I love books just as much as I do reading them. I feel that books and reading are essentially one and electronic readers cheapen the experience of reading. I enjoy judging a book by its cover, reading the blurb, and searching for a book in the aisles of a bookstore, or on the streets of Bedford Ave. in Williamsburg, Brooklyn. I like penning my name behind the front cover of a book after having finished reading one. I’m completely aware of the perks of having an electronic reader and I also like the idea that it’s an eco friendly device, but the core of my opinion is that as electronic readers gain popularity my childhood obsession is becoming a thing of the past! And I don’t like it one bit. The only thing I can do is continuing to buy books used and new from bookstores as a way of pledging my allegiance to books in print form. I don’t even like buying books online because it’s just not as fun. A few bookstores I’m particularly fond of are: Alabaster Bookshop, McNally Jackson Books, Strand Bookstore, Cobble Hill Community Bookstore, and Bookcourt. 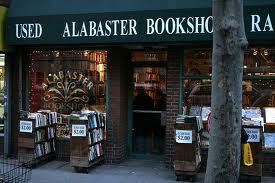 Alabaster Bookshop is located on 4th Ave. between 12th and 13th Street just around the block from the famous Strand Bookstore. Alabaster is the place to go when in need of a used book at a cheap price. Not only that but the small store has an extensive selection of fiction as well as books sold for a mere 2 dollars on the outside. Alabaster is old school and sans database so searching for a book here is more of an adventure, and you’re more likely to unexpectedly find a book of interest. Strand is 18 miles worth of books and is well known for their staff picks as well as their Strand 80, which is a pick of 80 of the most popular books amongst Strand customers. Cool fact: Patty Smith worked at Strand during her early years and beginnings in New York. It’s pretty much a guarantee that you’ll find just what you’re looking for because Strand is colossal and filled to the brim with books. It’s basically a nerdy paradise. McNally Jackson Books interestingly categorizes their books by nation and they also have a great in-house café too. If you’re looking for that Dostoevsky head to McNally Jackson’s Russian literature section or if you feel like dissecting some short stories by Flannery O’Connor browse their American literature section with a cup of Joe. Cobble Hill Community Bookstore is probably my favorite of all because it’s everything that a bookstore should be. It’s a neighborhood staple and also wonderfully unorganized; you can find such treasures in mountains of books piled on top of one another. It is very charming and the prices are great too. Just a block or two from the Cobble Hill Community Bookstore is Bookcourt, which is quite the opposite of its neighbor. It’s two floors of hyper-organized, well-cultivated book sections. They also have in-house events and shoot out weekly emails with announcement and specials, which is incredibly convenient. Because I’m a starving college student, student discounts are always of the utmost importance to me when splurging on items outside of necessities. Luckily Namaste Bookshop provides student savings and I’ll be sure to check out this bookshop specializing in Eastern philosophy and health books. 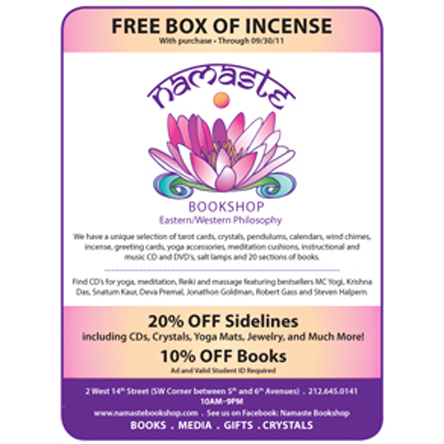 You can also buy yoga related items as well as oils/incense at this relaxing spot. If you’re a fan of books then show your support and buy a book or two from one or more of the bookstores mentioned! Many summers ago I read a book—the name of which I have finally managed to forget—and it was, to say the least, depressing. It was a gloomy story about two sisters in which all of the characters were lonely, depressed and incapable of feeling joy. As if that was not miserable enough, the few people in the protagonist’s life die, leaving her lonelier than ever. This book could singlehandedly drive the peppiest person in the world into a funk. Since this dismal experience I have taken to reading chick lit novels. They are funny, not preachy, and they always have a happy ending, and thus are always good for some light reading. P.S. I Love You by Cecelia Ahern: This book is worth reading even if you’ve already seen the film version of it. It is the touching and hilarious tale of how Holly tries to start a new life following the death of her husband. Interestingly, she does so with the help of her dead husband, as it turns out he had written her a dozen letters while he was suffering from the brain tumor that took his life, to help her move forward after his death. Bergdorf Blondes by Plum Sykes: The nameless narrator and her best friend, Julie Bergdorf, live an exaggeratedly glamorous life in New York. Julie is a kleptomaniac who comes from a wealthy family that once owned Bergdorf Goodman. The narrator hails from Britain, and her mother insists that she marry the Earl next door. Everyone around them is engaged, and Julie becomes determined to get engaged, too. The girls are sweet, funny, frivolous and unrealistic. The book gently and humorously mocks how ridiculous society can get without getting too harsh or negative. Debutante Divorce by Plum Sykes: In this book, a divorcée is the trendiest thing to be. The characters in this one are slightly deeper than those in Bergdorf Blondes, but the overall tone is the same. Newlywed Sylvie Mortimer becomes BFFs with divorced heiress Lauren Blount, whom she meets on her honeymoon after her husband, Hunter, abandons her to attend to his work. Even though Sylvie and Hunter have a great relationship, Sylvie’s confidence in her marriage and Hunter’s fidelity begin to falter as circumstances get suspicious. Twenties Girl by Sophie Kinsella: Lara gets visited by the ghost of her great aunt Sadie, who was a flapper in the twenties and who demands that Lara look for her missing necklace, without which she cannot rest in peace. Remember Me? by Sophie Kinsella: After a car accident, Lexi rises from a coma to discover that she has completely forgotten the past three years, during which time her life has miraculously transformed into everything she ever wanted. Things turn sour for Lexi when she finds her personality had changed, too, and her new life is not as perfect as she had thought, and she desperately tries to put the pieces of the puzzle together. Shopaholic series by Sophie Kinsella: Currently there are six books in this series. It is about the life and shopping addiction of the charming, impulsive and overly optimistic Becky Bloomwood. All the books are hilarious and worth reading but Kinsella loses her touch a little in the last one, Mini Shopaholic, which is not as good as the other books. Something Borrowed and Something Blue by Emily Giffin: Something Borrowed is narrated by Rachel, who, despite being a “good girl”, ends up sleeping with the love of her life, Dex, who also happens to be the fiancé of Rachel’s lifelong frenemy, Darcy. Its sequel, Something Blue, is narrated by Darcy has been betrayed by her best friend and ex-fiance and has a baby on the way. She flees to London to visit a childhood friend, Ethan, and to attempt to recapture the glamour of the life she had. 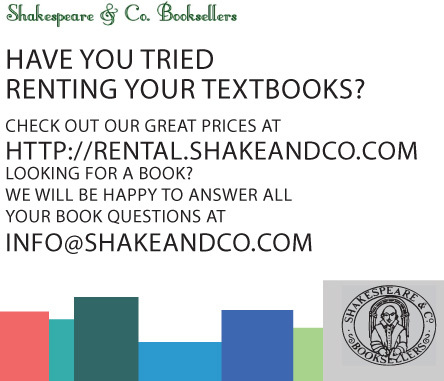 Speaking of books, check out Shakespeare & Co. where you can rent your textbooks. And, to look for great student discounts you can visit www.campusclipper.com. When there is a language barrier involved, it can be hard to find an activity that pleases everyone. We found this out one night when my dad, my grandmother (on my mom’s side) and I were home one night, in search of something to do. My grandmother is Japanese and speaks no English, my dad is American and speaks no Japanese, and I am half-Japanese with an eight year old’s grasp on the language. My mother, the main translator, was out on a reunion with old friends, and my sister, the one who often lightens the mood, was at a birthday party. It was an impasse. Maybe in another situation we would have tried an activity without words, like a game of catch or some other sport. But as much as I love my grandmother, I didn’t imagine a pickup game of soccer would be her thing. It was my dad’s idea to put on a movie. He found some Japanese films on Netflix, and, hoping they were subtitled, put several of them on instant. 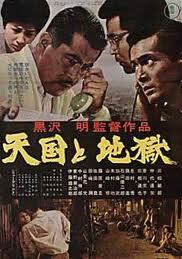 To our dismay, most of the films, even the ones from the foreign film genre, were dubbed over with English voices. Not only was this disappointing, but in our case, it completely defeated the point of watching a Japanese movie at all. So when we finally found a movie with the original Japanese voicing and English subtitles, we were so glad that we just agreed to watch it, without even really considering what the story itself was. It turned out to be a drama, titled High and Low, about a businessman who has to decide between his company and saving his chauffeur’s kidnapped son (guess which he decides). Although it was a wordy film, the acting was great to watch, and this made it enjoyable for everybody. Although I didn’t think of it at the time, another movie option would have been something wordless, like a silent film. Silent films are something of a rarity these days—I’m not particularly a fan, and it seems that few other than dedicated film-lovers would choose a film without dialogue. However unlikely, my sister is a fan of Abbot and Costello, and she swears the films are accessible to anyone. They’re not too popular now, but I can’t imagine a more appropriate time for a silent film than when language itself is the problem. Other times, when my dad isn’t around, we watch animated movies in Japanese. Although a relic from when my sister and I were younger, all of us still have something of a weak spot for cute characters, and Miyazaki films are prime material for that. Our favorites are My Neighbor Totoro and Kiki’s Delivery Service. My sister or I might miss a few key points if the characters talk too fast or use more sophisticated words, but animated movies in general are pretty easy to follow even with a spotty understanding of the language being spoken. Not only that, but they almost always have a happy ending, and none of us would have it any other way. Movie nights are a great way to connect with people regardless of differences. DVD Funhouse offers student discounts; with these student savings, everyone will be pleased. Download our new iTunes App! Don’t forget to sign up for our bi-weekly newsletter for more discounts and promotions, and download our coupon booklet now!